Entrepreneurs are the lifeblood of the global economy. We put it all on the line everyday. We are risk takers and innovators that operate without a safety net. Typically we learn by making mistakes and hopefully learning from them. As kids you might remember the Bozo the Clown punching bag. You punched it down and it always came back up, a great example of our tenacity and personalities. And yet where do we go to learn to avoid situations which occur in our businesses everyday? 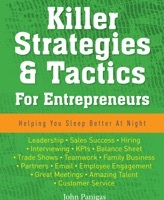 Killer Strategies & Tactics For Entrepreneurs is a result of the bumps and bruises on my backside of 30 plus years as an entrepreneur and the successes of great clients from my coaching practice. It is not designed to answer all the questions and solve the issues that we deal with everyday. It is designed to allow the reader to think deeper about certain situations and issues that may arise. Examples are provided that will assist you, examples that have been proven to work. The book is short, 20 chapters each that stand alone. As Entrepreneurs we generally have short attention spans so reading the book can be done in short spurts of 5-10 minutes at a time. If the topic is relevant read through it and you'll get great insights to make your bumpy journey smoother. It is my ultimate desire to see you succeed, that is what gets me up each morning. This book is the first of a series of Killer Strategies & Tactics as 20 topics cannot possibly cover all the issues Entrepreneurs have to deal with. With the aid of my readers needs and suggestions and my ongoing efforts expect more books in the future. Enjoy the ride!